Valentine’s Day? Since when has love needed to express itself on a set date? Granted, the tradition goes back centuries before florists, candy-makers and Hallmark turned it into another opportunity to pull out the plastic. In fact, it goes back even further than the Christian calendar: like many of its celebrations, the Church grafted it onto older pagan rituals. The period between February 13 and 15 was when the ancient Romans celebrated the Lupercalia (from lupus, “wolf” in Latin) to honor Faunus Lupercus, the protector of flocks: a goat, the symbol of fertility, was sacrificed by two naked young men in the grotto where the she-wolf fed the legendary founders of Rome, the twins Remus and Romulus. The celebrations involved a lottery where young men would draw the names of maidens from a jar and squire them for the duration of the festival, hence the link between the pagan fertility and purification feast and saint Valentine’s patronage of lovers. 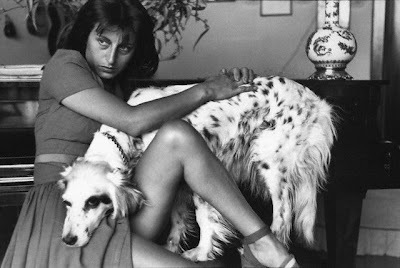 So rather than the mawkish day of roses and chocolates, I would rather celebrate the goat and the she-wolf with a picture of the heroine of Rossellini’s Rome Open City and Pasolini’s formidable Mamma Roma, the patrician peasant Anna Magnani, and a note on a she-wolf, he-goat smell that came to me from Italy, courtesy of Abdes Salaam Attar, also known as Dominique Dubrana of Profumo Italia. I’ve never met Salaam or even spoken to him, but we’ve exchanged emails. He’d promised to send me a few samples and when the envelope arrived, as soon as I unsealed it the cat literally teleported herself next to me, trying to pry a little stone from my fingers, purring and meowing like a mad thing. I had to lock up the cat before having a proper sniff, which yielded fascinating observations: a smell all at once animal, mineral and vegetal with facets of blood/old penny, acetic acid (present in vinegar), apple, flint, patchouli, vetiver, pepper, cow and horse dung, herbaceous notes (basil? ), blackberry, blackcurrant bud, ink, leather, olive… The closest thing it came to in perfumery was castoreum. I immediately shot off an email to Salaam to ask him what the stuff was: he replied he’d deliberately not identified it so that I would ask him the question. But by the time he answered I’d sussed it out on my own: the little rock now resting in a feline-proof box was hyraceum, otherwise known as African Stone, the fossilized urine of a rabbit-sized South African beastie called the hyrax or dassie. Hyrax colonies urinate at the same place, often for centuries and their urine is jelly-like rather than liquid. Over time, it fossilizes and can be collected in chunks. It has been used in vernacular medicine for centuries and the perfume industry has been considering it as a replacement for materials of animal origin, since it is cruelty-free. After all, it’s basically recycled piss. African Stone has nothing at all to do with Saint-Valentine’s day, but to me it is the smell of the Day of the She-Wolf. I can bill and coo with the best of them, but there are some days where I’d rather howl. What about you? What’s the smell of the She-Wolf for you? You can order a hyraceum stone tincture kit from Profumo Italia by clicking here. Illustration: photograph of Anna Magnani. I never saw Roberto Rossellini's Rome Open City, I think I'm going to order it on Netflix. My she-wolf perfumes...vintage Narcisse Noir, Muscs Koublai Khan, Tubereuse Criminelle. I hate the commercial and materialistic aspect of Valentine's Day; the candle lights dinner, the roses, the cheap chocolates, the trendy perfume bottle or worse the cheap diamond engagement ring from Jared, aww please not that! This year I told my boyfriend no perfume, nothing rocks my (perfumed) world at the moment, instead I asked him to take me next week to the Theory's flagship store in the meat-packing district of Manhattan, I'm such a fan of Olivier Theyskens. Thank you for this very essential antidote, Denyse! I'm very fond of Nina Ricci Fille d'Eve, an animalic chypre with costus. The contrast between the high and low notes in this perfume is just thrilling. Well, my husband doesn't know it yet, but he has taken advantage of the Ormonde Jayne free shipping offer. Perhaps Ormonde Woman will be my she-wolf scent. Ahh-wooooooo! I know exactly what you're talking about, and I want some! Sophia Dutoit down in South Africa has been working with local groups to promote fair trade, earth-friendly perfumery ingredients from Africa, there's some magical stuff down there, Mane picked up on some of it, and I'm not surprised Jicky went crazy! Rome Open City is a very rough, moving film, shot on location just after the war. Definitely not a popcorn movie. Nozknoz, I've never actually smelled Fille d'Eve and I suppose if the costus (more sheep than goat but never mind) is real then it's vintage! Cheryl, Ormonde Woman *does* have a deep green forest-y note. It's grand stuff. Marla, for the cat I think it's the pheromones -- must be filled with them. She doesn't even react like that to civet despite her name! I know the material is being offered now under a couple of different names like "Golden stone". "Golden Stone"- haha! I like that euphemism. It's made from thousands of years' worth of both hyrax pee and poop, I was reading up on the chemistry, incredibly complex stuff. You can try tincturing it and wearing it as an experiment. I think someone from the Natural Perfumers' Guild did that, actually! Had I known you hadn't smelled this, I would have got it out the cupboard! And Lupercalia- great name for a fragrance! Alexander, come to think of it, I've never smelled your ambergris either: that should be the priority in March! Hmm... the smell of the She-Wolf...? Well, MFK's Absolue Pour Le Soir springs to mind, probably because it's a fairly recent release. And I love the funky depth of Shalimar extrait. Could Kouros count as a She-Wolf scent? Or is it a He-Goat? Persolaise, I'd say Kouros is pretty Panic! Nice subversive Valentine's Day post! Well, curiosity in this case didn't kill the cat but got her locked out of the room. I often thought about this. Sending perfume in an unmarked sample to someone who knows a lot about perfume in general and then let them comment. What would the outcome be if there's no price-point, brand or anything to go by? Might be surprising as I think were all prone to predjudice. Ah, the stinker? Absolue pour le soir, only wore it once.People around me literally got up and left..
A very happy late Valentine! Illdone, in that case it wasn't even perfume, but a little stone and a raw material! So it took me a while to connect it to a material present in Dionysus by Adam Gottschalk which had had a similar effect on my cat during the Mystery of Musk / Natural Perfumers Guild operation last summer. Re: blind tests, I think a few blogs have done things like that. And I think it's happened to all of us with those pesky samples that lose their labels! GGS, yesterday I absentmindedly used a blotter with African stone tincture on it as a bookmarker, and before I knew it she'd licked it so much it was soaked through, as was a patch of my sleeve! Nicola, Becky Sharp is such a great name for a cat! See how she reacts to that natural perfume and report back! Cheryl, the same thing happened to my husband recently, also with Ormonde Woman. But I found Amouage Epic Woman more she-wolf than Ormonde. After a few wears, I find Ormonde comforting. Denyse, I enjoyed the post! My head was spinning, trying to imagine the African Stone. Jelly-like pee, eeeish, who knew where perfume blogs would take me. Carla, well, we swoon over vintage perfumes made from all sorts of unsavoury beastie bits, so why not this? Costus doesn't sound very interesting ("dirty hair" "between plaster and goat"), but I find I do like perfumes that supposedly have it (not sure if my Fille d'Eve is old enough to have real costus, or if it's the synthetic substitute). Nozknoz, costus can definitely give a "mutton couscous" smell to a product when overdosed. Yuck. Nicola, it could be because the hyraceum is present in small doses. I found that Jicky was less demented with the tincture than she was with the acual stone, but "less demented" means she licked the blotter through, so that's all very relative. Cats are nutters anyway. Well, to my nose wolfy and bitter though so close and caring, like mother that can feed out of nothing - is a once disappeared scent that I loved years ago. Unfortunately, where I live, this vintage thing would cost one a local monthly salary. I mean Empreinte Courrege, with it's patchouly-labdanum-sweet-sweat-warmth-teeth-and bitter tears mixed with high spirits like old whiskey or cognac. Wild one, almost non-feminine, yet motherly. Very Magnana one, I guess. Well now, I've got to smell Empreintes! does he sell the african stone, btw? sounds like something i'd like to sniff (georgie, too). Minette, valerian makes her go nuts indeed. Friends of mine who regularly come to visit use them, and the man finds it hilarious to make the cat smell his capsules. But I've been told by the vet that absorbing the valerian in such concentrated form could be harmful, so I'm always scared she'll lick up a stray capsule..
And, yes, the African stone is for sale at Profumo Italia via the link in my post. I have some in pre tinctured form from a few years ago. On reading your blog, I offered a sniff to my kitten and she did a very complex chem analysis on the stuff. Very intrugued, though admittedly she fancies herself a apprentice perfumer anyway. Her reaction was not so different from a rat sniffing tinctured ambergris though then went on longer! Anonymous, you made a rat smell tinctured ambergris? I have neither on hand but it must've been interesting. As for cats, I'm pretty sure they have a very definite idea about our exploration of smelly things, but they're too lazy to tell. I wouldn't say "made a rat" since the rat in question did more of a grab for the lid so it was more than voluntary! LOL This was a pet. Fascinating and it was one of the many times I wondered just what exactly they can smell that I can't. Same to a lesser degree with cats. Yes I really wonder too what they perceive... My present cat is, of all the cats I've had in my life, the one who is most interested in smelling perfumes. But perhaps it's just a case of the two-creature human/animal culture that develops between a pet and her human: she's interested in what interests me. Yes, same with my kitten now, though I have to say, she also has the most HUGE nose I've ever seen on a cat! She was a feral rescue, which might or might not have anything to do with it. I do think you have the right idea where if they idolize their human they will develop parallel interests.